After your first visit, you will want to come back year after year..........look at the many reviews. The 1 bedroom unit is very clean and has granite counter tops, fully tiled shower, landscaped private backyard, large dedicated parking spot right in-front, and Air Conditioning which is unusual for most rentals in the area. Located in a quiet area just just 2 blocks from famous Moonlight Beach, and 4 blocks old-town Encinitas. Encinitas is considered by many as one of the true gem beach areas in the county, providing many niche eating and shopping options. Amenities include a queen sized bed, stone floor, and the entertainment system includes a 50 inch flat screen TV with access to see and record on DVR all local and standard cable channels, plus Netflix. Sit in your private backyard which is lushly landscaped and includes a Weber gas barbecue. Free wifi. We have had great feedback, just check out the comments left by our guests. HOUSE RULES: No smoking on property including backyard, must be over 25 yrs old (or approval needed via email), no events, no parties, quiet after 10pm. 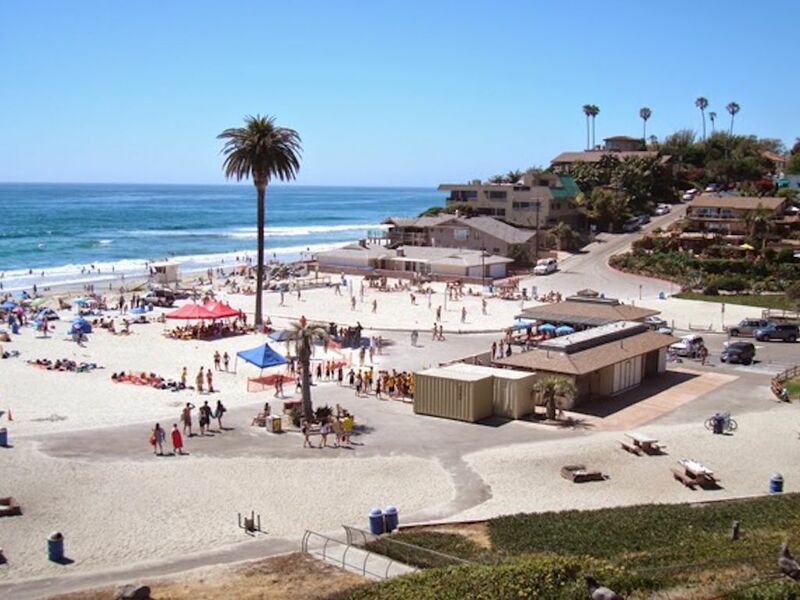 Moonlight is one of the most popular beaches in North County San Diego, with facilities that include restrooms, showers, volleyball courts, fire pits, barbecues, beach rentals , children’s playground, and even a great snack bar! If you want a more secluded beach, just walk about 100 yards north or south on the beach. Walk into downtown Old Encinitas and eat at one of the many great restaurants or shop at the small unique shops. The unit has complete set of dishes, linens, towels, beach chairs, umbrella, and wifi. Also has private washer and dryer. There is no bath tub, so for small children, it may not be a great place. We are dog-friendly. The unit is best suited for small to mid-size dogs. No spoking in unit or in backyard. Dogs can not be left alone (inside or outside) if they bark. If this unit is booked for the time you want it, look at my other VRBO properties (#4054307 and #821584) which are both 2 bedrooms and also located just a few blocks to the beach in Oceanside, just 10 miles north of this unit. I have lived in the San Diego area for over 34 years and in Encinitas for over 24 years. My wife and I grew up back in NY/NJ. I first visited the San Diego area while at Arizona State and immediately knew I found the place I wanted to live. I worked as an engineer. Encinitas has a small beach town atmosphere, people are very friendly, and it has the best beach around. The rental unit is very private with its own entrance and typically I don't see our renters for days on end. But if you need something..I am close. Take our beach bikes for a ride on the beach during low tide, it is a great experience. Also stream hundreds of Netflix movies at no charge. The unit is just 5 short blocks from downtown Encinitas which has many great unique restaurants and retail shops. All local and standard cable channels provided. Plus Netflix. Small lawn with landscaping all over. Two single gear beach bikes are available. Boogie boards, beach chairs, beach umbrella, and small cooler is provided. Close to a great beach. Best area around. Our host was attentive and pleasant and we would return for another visit! I will definitely use this dog friendly property again! Nice clean property in a great area! Our stay was fantastic! Communication with Warren was excellent. Check in instructions were easy and explained well. Everything was very clean and organized. The apartment was well stocked from the kitchen, bathroom, and extra blankets. We enjoyed using the outdoor patio area and loved access to the private backyard. The beach chairs were an added bonus and we used them each evening to watch the sunset! The location couldn’t be more convenient... just a few blocks to the beach and easy access to the restaurants downtown. We did not have a car and walked or biked to our destinations. It was perfect! This place was perfect! Plenty of space for us and our spoiled dog. Nice, fenced in backyard for the dog to get some sun and fresh air. The place itself was within blocks of everything...the beach, shopping, food. We only got in the car when going to a town outside of Encinitas. Our host was very friendly and came and introduced himself to us upon our arrival. Couldn't have asked for a better experience. As someone who believes that the Encinitas' Moonlight beach area it is a truly special place, I just love seeing renters take advantage of all the local restaurants, shops, and beaches. Lovely place, perfect location, my favorite town! This is a lovely place. Comfortable, convenient and near everything! Warren and Meryl are fantastic hosts! Highly recommend! Located 2 blocks from one of the most popular beaches in San Diego County, and blocks to one fo the best beach towns in the country.